I wake early in the morning. There is a cool freshness in the air. I try to move. Everything hurts! My soul, my heart, my guts, they ache with a heaviness of the past night. My eyes are sandy, my throat parched. It hurts. I look for Him--He is there, beside me. He is still, quiet. I wonder if He is sleeping. My thirst drives me to rise and head to the stream nearby. I pull His robe around me more tightly. Should I drink? I wonder. I am afraid; He did say I was welcome here, that I might freely wander. So I drink. The water is cool and sweet. I wash my eyes, my face, and drink again. The freshness of the water is a foil for my pain. "It hurts!" I whisper, not wanting to disturb the quiet of the morning. Idolatry! Pride! I still shudder at these revelations--I can't believe it and yet it is there. My soul is weary and it aches. I remember His offer--'Let me heal you'. It sounds so inviting right now--I remember the restoration of His touch as He washed the stain from me last night. I want to invite Him--but I cannot yet. I try to convince myself that it is Him, but it is not, it is me. I am not ready to face those wounds. I just cannot look there, now. Across the way, I see the tree. Strangely, I am drawn to it. I walk toward it, pulling His robe, His righteousness I see now--more tightly about me. 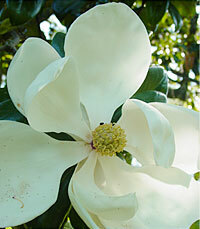 In the back of my mind, a stray thought crosses--I have always loved magnolia trees. I stop at the tree, wondering why I would have come there myself--what is drawing me? I remember—oh, I remember so much! I feel weak, spent and find myself holding to that tree for strength, finally laying down upon that lower branch. I rest there, covered in His robe. A part of me wonders though, why am I here? I could be back at His side instead. "I am here," It is His voice, and I find that I am afraid. "I knew you would be here." His voice sounds pleased. "Why?--I don't understand. Why did I come back to the place where I found so much pain?" I ask in my confusion. "Your flesh is in pain right now--I know you are hurting." He begins. At this, though, I begin to weep. He knows me, my hurts! He sits beside me, puts my head in His lap, stroking my hair and comforting me. "But your heart has tasted fellowship with Me. It is your heart that is drawing you here." I weep, I do not quite know why. Finally, I open my eyes. "The view is beautiful from here." I manage to whisper, just to say something. The garden is beautiful, though, it is the Master's work, without a doubt. "Yes, it is," He says, but I think He is looking at me. We stay there for what seems like a long time. His words are ringing in my spirit. "I have not really given you my heart yet, have I?" I hesitantly ask, a little afraid of the answer. "No, not yet." He gently replies, stroking my hair again. "It is all right, I will wait." I find I feel safe here, now, with Him. Part of me wants to press on, to bulldog ahead to where He has for us to go today. Something though, holds me back. "Rest here," He says firmly, "No striving, you cannot pretend or push through here. Do not try to impress here." In obedience, I give up the idea and return to rest. We are both quiet, but the silence is comfortable, not foreboding. Finally I find there is something I must ask. "Papa, Papa God--is it…can I call you that?" I feel a pang of fear at the possibility of having crossed a boundary with Him. "Yes," His voice is smiling. I muster my courage to ask my question now, "Were you looking at me then?" Pausing a moment, I ask, "What did you see?" I cannot imagine what He might have found to cause Him to say that. "Your heart--I delight to see your heart, it is beautiful to me." "But it is not wholly yours yet." "I know, but it will be. I am patient." We rest there for what seems like a long time. Finally, we rise to go. Not knowing what else to do, I begin to remove His robe, to return it. "Why do you return My robe? I gave it to you, not lent it to you." His tone is surprisingly firm, almost cross. "But I am not clean! I cannot wear this!" "That is why I gave it to you--to cover your uncleanness." I put it back on, marveling at the gift. It is whiter than anything I have ever seen and softer than anything I have known. It is gentle, warm, covering the raw places of my heart. I see now that He had always sought to give this to me, but I had refused, preferring my own coverings--rags by comparison. I pull it around me, marveling at how precious it is. I feel covered, safe. I know what is within me, but this robe covers it all. Seeing this, I have a glimpse of just how far we have yet to go. I doubt my strength.